sorry, I don't think the stuff showed up. The Public Prosecutor of Aruba has strong criticism of the way the media have done the disappearance of Natalee Holloway. Reporting Some media have paid witnesses, falsified evidence and traces manipulated, says Chief Justice Peter Blanken in an episode of the TV program Media Logic that is broadcast tonight. The program was created by Crime Site editor Vincent Verweij. "They have witnesses put things in the mouth and paid for explanations," said Whites. "There are even manipulated tracks. They came suddenly with bones turn that down somewhere and were then presented as bones of Natalee Holloway. " The police investigation into Holloway was media-driven 'and too focused on Joran van der Sloot says Whites in the HUMAN VPRO documentary, which was made by Crime Site editor Vincent Verweij. Other scenarios about what happened the night in question, are therefore 'not sufficiently investigated. According to the Prosecution patted little of the broadcast of Peter R. de Vries in 2008, with Joran van der Sloot in a car aflegde statements on a hidden camera. "Peter de Vries is the nose made by Joran," said Whites. 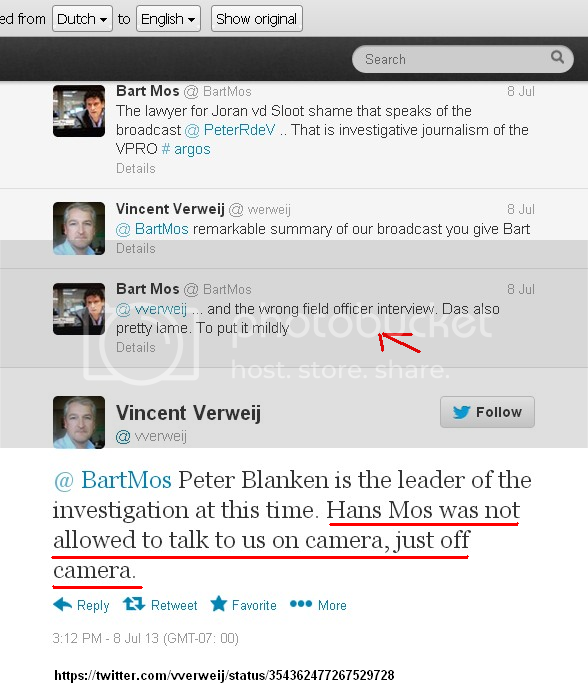 Media Logic was able to explain to the police file on the case, which also contains DVDs with the raw, unedited camera images from De Vries's hand. From their analysis that Joran van der Sloot a salary of three tons in a promise was made by Patrick van der Eem, what exactly is unclear. There are no indications that there has actually been paid to Joran. The file also shows that De Vries material two weeks before the program offered by the Public Prosecutor and asked them some essential facts to check. As Daury, the man who helped Joran would help with getting rid of Natalee's body. The prosecution asked a few days before the broadcast of Peter R. de Vries for more time to complete his investigation but De Vries has there not been waiting and let the show go by without having checked. key facts themselves Facts which later turned out to be wrong. Absolute hogwash!!! Aruba has paid NO attention to ANY evidence no matter what the source. Eight long years later, they are still engaged in the cover-up of the century. To get the whole story wouldn't they need to go back to the beginning? What about Karin Janssen (sp)? Not that they're going to get the whole story at this point anyway, but at least give the impression that you've tried? Link to the recent documentary, haven't seen much of it yet but even without understanding the Dutch spoken; looks like more of the same so far imo. When Julia Renfro has a lead role in the documentary it doesn't say much for it. The truth and nothing but the truth in the Holloway case. When the schoolgirl Natalee Holloway disappeared in Aruba in 2005, the U.S. media flooded the island. Joran van der Sloot, the Dutch murderer who is currently stuck in the infamous Piedras Gordas prison in Lima, Peru appears next to his fiancee also have. A Dutch girlfriend It reports weekly Panorama. "He's not the monster that everyone thinks he is. Everything is exaggerated in the media, "said the woman who wants to remain anonymous. The 30-year-old Dutch Anouk (fictitious name) is "crazy killer Joran. "From my allowance I pay his phone bill, so I can what juices with him all day. He soon married a Peruvian does not diminish our love ', she tells Panorama. She also regularly sends an envelope with money on the Piedras Gordas prison where the Dutchman a prison sentence of 28 years for the murder of Stephany Flores. That Joran her with her financial aid may be used, find them nonsense. "In the beginning he did not even want my money. So he's not a monster. Only if I can spare, I help him. Without money, you are nothing. He is vip, apart from the rest. Own food, recently he has a TV with DVD player in his cell. But he has to pay for it everywhere. "The money is to come from relatives, especially his American 'aunt' Mary Hamer, the radiologist who assists him, acting in accordance with Anouk 'quite a bit. " Leidy, Mary Hamer, Dutch girl- all sick - takes all kinds. Birmingham today to ask that the case that Beth filed against them be dropped. Beth had accused the NE of publishing untrue information about Natalee. BIRMINGHAM, Alabama - The National Enquirer has asked a federal magistrate judge in Birmingham to dismiss a lawsuit filed last year against the tabloid by the mother of Natalee Holloway, the Mountain Brook teen whose disappearance on a 2005 trip to Aruba triggered international headlines. Attorneys for the National Enquirer declined comment regarding the lawsuit, or their quest to have it tossed out, after a case status conference with U.S. Magistrate Judge T. Michael Putnam this morning in the judge's office at the Hugo L. Black U.S. Courthouse in Birmingham. Lin Wood, an attorney for Beth Holloway who participated in the conference by telephone, stated in an email later that Putnam is expected to issue an order addressing the their right to limited discovery in the case before responding to the recent motion for summary judgment filed by the National Enquirer. Putnam on May 22 dismissed the invasion of privacy claims against the National Enquirer in Holloway's lawsuit but denied dismissal of the remainder of the lawsuit for the tort of outrage and intentional infliction of emotional distress. Attorneys for the tabloid and its parent company, American Media, on July 8 filed a 56-page motion seeking summary judgment to dismiss the remainder of the lawsuit based on a number of grounds. Beth Holloway filed the lawsuit on June 20, 2012 claiming the National Enquirer had published false and horrific headlines, statements, photographs and articles regarding the search for Natalee Holloway. The lawsuit seeks damages for three publications, on June 28, 2010, December 6, 2010, and April 25, 2011, which purport to describe treatment of Natalee Holloway's corpse. "Defendants' conduct in publishing these false statements and accompanying manufactured photographs has been so outrageous in character, and so extreme in degree, as to go beyond all possible bounds of decency, and is to be regarded as atrocious, and utterly intolerable in a civilized community," according to Beth Holloway's lawsuit. Natalee Holloway was one of about 120 students from Mountain Brook High School who took a senior class graduation trip to the island of Aruba in May 2005. The students began their trip on May 26, 2005, and were scheduled to return to the United States on May 30, 2005. At about 1:30 a.m. on May 30, 2005, Natalee was last seen entering a car with Joran van der Sloot, Deepak Kalpoe, and Satish Kalpoe. 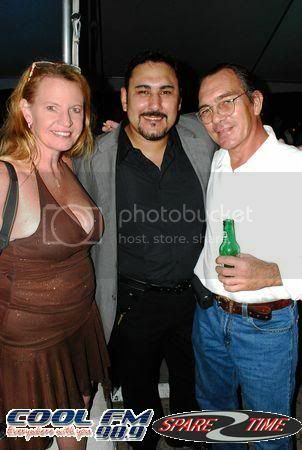 It has been soooo long ... just what is the status of Natalee's case in ARUBA??? Closed, open, abandoned, still hoping it never happened???? What are the tourism stats??? JMO wreck, but it looked to me (from watching the video) that the last documentary group had free reign with the case file; so my guess would be that they're not investigating anymore. in spanx that has lost it's spandex. Wo!! I never seen this photo either! It seems like he's saying he's nervous and needs to be drinking at that point. And Koen replying to the picture?? What were his words Kermit if you have them anywhere?